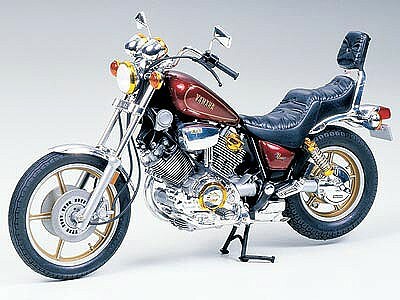 This is a 1/12 Plastic Yamaha XV1000 Virago Motorcycle from Tamiya. Retail $29.00 SAVE 20% ! Tamiya has done an outstanding job putting this model together can&apos;t go wrong buying this one .The price is right to. Parts attached to sprues and molded in black and silver; chrome and clear pieces also included. Powerful 981cc, twin cylinder air cooled engine in "V" format. Small diameter rear tire has a large cross section for a smooth ride. Includes small screws, brake lines, and small springs. Detailed and informative pictorial instructions. This is a really nice model to put together. It even has the spark plug wires. I messed up one of the tires trying to put it on the rim, so I wrote the company and they sent me one out . It only took a week and they didn&apos;t even charge me for the part. All and all a really good build.